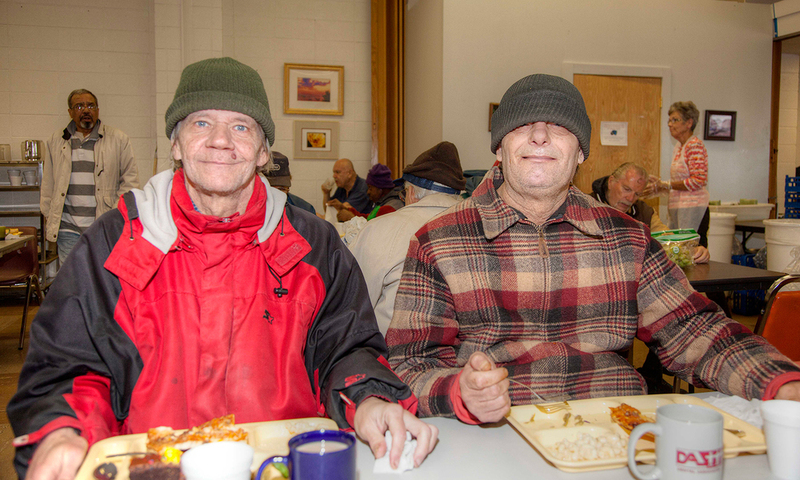 Our Community Meal Program is the heart and soul of the Gathering’s mission. Ten/eleven free home-cooked meals are prepared and served each week spread across four Milwaukee locations. All meals are cooked fresh on site. 98% of direct service work is done by 1,500-2,000 volunteers annually. The Gathering welcomes everyone to our meal sites without regard to race, religion or lack of a faith belief, national origin, gender, age, handicap, or sexual orientation. The Gathering serves 51 weeks out of the year, closing for one week between Christmas and New Years and on major holidays The exception is our downtown site which remains open for lunch the Saturday between Christmas and New Year's and - as the calendar permits - for breakfast on New Year's Day. Below is our meal schedule and our locations. At certain times, our guests can find access to medical assistance, legal assistance or free clothing and sundries. Volunteers are the backbone of our Community Meal Program. Interested in cooking, serving or assisting at one of our meal locations?